A Kansas City suburb known for its schools, sports and professional talent, Blue Springs sits at a crossroads of Jackson County with I-70 and U.S. 40 highways running East-West while growth, retail and other development areas boom around Woods Chapel Road, Adams Dairy Parkway, Missouri 7 Highway and in a newly reinvigorated downtown Blue Springs. Incorporated as a city in 1880, Blue Springs saw massive population booms in the 1980s and 1990s, topping over 53,000 residents today. Interestingly, more than 14,500 of those residents are K-12 students in the nationally-recognized Blue Springs R-4 School District, making Blue Springs one of the youngest communities in Jackson County. 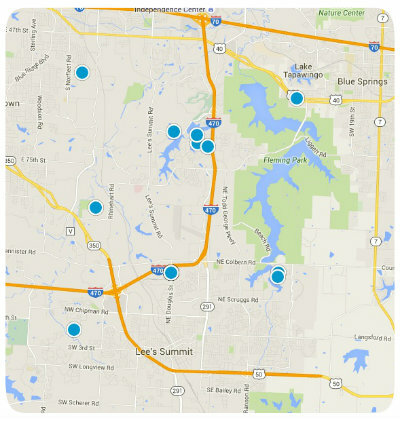 With the abundance of families, you’ll find more than 20 parks inside the city limits of Blue Springs. Its incorporation in 1880 made it the fourth city in Jackson County, actually predating Kansas City at the time. While the city was settled by Franklin Smith – and an elementary school here bears his name today – it derived its name from the abundance of clean water from the Little Blue River spring. The city has been recognized regionally for its innovation and creative development, including industry awards for the Howard L. Brown Public Safety Building and the Blue Springs Fieldhouse. Blue Springs is known for much more than buildings, though. NFL players Ladell Betts and Brandon Lloyd both graduated from Blue Springs High School, as did NBA players Steve Harris and Jon Sundvold. And 2008 American Idol winner David Cook is a Blue Springs South graduate. If you would like more information regarding homes for sale in Blue Springs, Missouri, please contact us today. Listing courtesy of Claudia Everhart of Exit Realty Professionals. Listing courtesy of David Slawson of ReeceNichols CC Plaza. Listing courtesy of Joanna Mispagel of ReeceNichols College Blvd. Listing courtesy of Beth Sohn of RE/MAX State Line. Listing courtesy of Debby Falck of Realty Executives of KC. Listing courtesy of Brent Weddle of Keller Williams Platinum Prtnr. Listing courtesy of Nicole Westhoff of ReeceNichols East. Listing courtesy of Mackaylee Beach of USREEB Realty Pros LLC. Listing courtesy of Michelle Rockholt of ReeceNichols Blue Springs.